Companies that use Sage 50 can win integrated email-marketing with Suntico's "solve the anagram" competition. Any company that uses Sage 50 accounting software can enter the Suntico "Solve the Anagram" competition to win a 12-month subscription to Suntico and an integration to MailChimp. With a free plan for up to 2,000 email addresses available from MailChimp, this effectively offers the winner an email marketing system integrated to Sage 50 for 12 months. "Any company that wants to get started with a simple customer newsletter can source their initial customer list from their accounting software." says Hugh Johnson, SVP Business Development at Suntico. 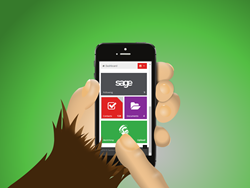 "The Suntico integration with Sage 50 accounting software and MailChimp enables this. In addition, your accounting software includes rich information about customer purchase history that you can use for segmentation." MailChimp is a popular email marketing system that is used by over 7 million people to send over 500 million emails per day. In addition to MailChimp integration, the winner will also have access to the full functionality of Suntico that can be used as a company-wide business-to-business account management solution. Suntico is an online account management system for small to medium sized businesses employing 10 to 100 people.